Now runs a garage in Poole & Jersey. Formed his own BTCC team Triple Eight Race Engineering which started racing 1996. 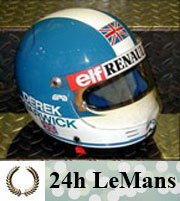 In 2011, Derek will probably de president of the British Racing Drivers' Club, succeeding Damon Hill. He is now Director at BRDC. Derek's younger brother Paul where killed in a British F3000 race at the age of 22, 1991.